Since the founding of Jaeger-LeCoultre in 1833, the company has had a very inventive history, developing over 1,249 mechanical calibres, registering over 400 Patents and playing a tremendous role in the development of the industry as a whole. Whether it is the keyless watch, Calibre 101, or the iconic Reverso, it would be difficult to imagine a historical account of watchmaking without the mention of Jaeger-LeCoultre. The company has always been a true ‘Manufacturer’ of the finest quality watch movements. This is unusual because more often than not, high-end brands such as Rolex, Patek Phillippe, Audemars Piguet and Vacheron Constantin would buy in movements for particular needs. 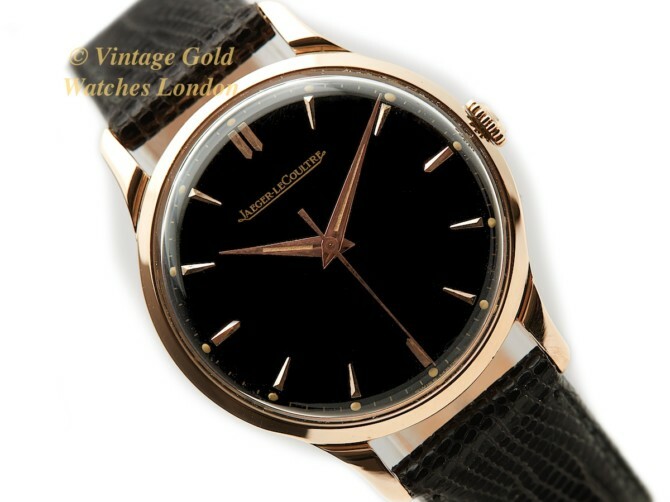 For example, in 1967 when Patek Phillippe, Audemars Piguet and Vacheron Constantin needed an ultra-thin automatic movement, it was to Jaeger-LeCoultre they turned, to produce one for them. Furthermore, the exquisite Jaeger-LeCoultre Calibre 920, is still in production and in use today by both Vacheron Constantin and Audemars Piguet. Jaeger-LeCoultre watches are all about the perfection of their movements, their wonderful aesthetics and the very high quality of their watch cases. Also, at any given price point, the absolute confidence that one is purchasing one of the finest watches available. Here we have a wonderful and rare example, with a stunning Black dial and 18ct pink gold case. This watch simply exudes style, high quality, elegance and pure class. Jaeger-LeCoultre movements are amongst the highest quality in the world and are very highly regarded by all watchmakers. The movement here is the Jaeger-LeCoultre JLC Calibre P800/C hand-wound, 17 Jewels movement. This legendary movement was designed and produced at the time when investment and development in hand-wound watch movements was at its highest. Research, rapid development and investment during and after World War 2, led to the Omega Cal.30T2, the IWC Cal.89 and the JLC K/P 800/C. Each of these legendary movements was designed from the ground up for new levels of shock resistance, reliability and accuracy. The K or P in the calibre number refers to the form of shock protection. Following an overhaul and service by our Jaeger-LeCoultre specialist watchmaker, the movement is running perfectly, having been calibrated and timed at +5 seconds per day. This is truly outstanding for a watch of this age and the watch also has a power reserve of 42 hours. This watch movement is now ready for many more decades of faithful service and we have no hesitation in offering this watch with our 12 month warranty*. We will also be more than happy to assist with servicing in the future. The movement is signed Jaeger-LeCoutre, Swiss Made and carries the Calibre number 800/C and the movement serial number 1264942 which dates this watch to 1957. The beautifully elegant Black dial carries applied pink gilt ‘Dagger’ hour indices, matched by original pink gilt ‘Dauphine’ hands. The dial is very simply signed Jaeger-LeCoultre with ‘Swiss Made’ at the very bottom of the dial. The combination of a Black dial and pink gold always looks absolutely stunning, but overall, the look, as with all vintage Jaeger-LeCoultre, is one of classic simplicity and elegance. The lens is new, having been replaced with a new original as part of the restoration. The 18ct pink gold watch case measures 33mm, excluding the correct unsigned crown. It was not until the 1960s that JLC signed all its winding crowns. This watch case is French, made for Jaeger-LeCoultre, as many were during the 1950s, so it carries French external hallmarks, along with the case serial number 744729 A. As with all Jaeger-LeCoultre watch cases, the quality of its design, construction and finish is immediately obvious. It is of a three-piece design, but this is very hard to tell without a high magnification loupe because the tolerances are so tight. The case, therefore, provides excellent levels of water and dust resistance. It is beautifully crafted and noticeably sturdier and heavier than many of its peers from the same period. Importantly, the case-back is of full thickness and has never been engraved. This watch case is in just fabulous condition. It has been very carefully inspected, cleaned and lightly polished and is immaculate. There are no scratches, dings, dimples or other marks visible to the naked eye. A new high quality Black Teju Lizard leather strap has been fitted, which we feel compliments the watch nicely, along with a rare, pink gold plated Jaeger-LeCoultre buckle. However, if a different colour or style of strap is preferred, please let us know and we will do our best to oblige free of charge. We carry tan, conker, dark brown and black in stock in plain padded leather, crocodile skin or lizard skin, but can also obtain most types and colours from our partners at ‘Watch Obsession’ within 48hrs. Although there are no original papers with this watch, the reference numbers, markings, signatures and hallmarks are all correct, dating this watch to 1957. Detailed particulars will be included with our purchase receipt and 12 months’ Warranty*. A separate insurance valuation for the replacement value of this watch will be provided at the time of sale along with our unique ‘Lifetime Authenticity Guarantee’ which states: “If this watch proves to be anything less than totally authentic, or not as described, Vintage Gold Watches of London will offer you a full refund at any time”. As with all our watches, this watch will be sold under our 14 days no quibble sale or return policy. A high quality hardwood presentation box is included in the sale of this watch. This is exactly the kind of rare and interesting Jaeger-LeCoultre watch we love to find, restore and present for sale here. It is many more times more elegant than the modern equivalent watch and if produced today, the same standards of quality and finish would cost many thousands of £££s. Even though it is over sixty years old, this watch is still completely fresh, reliable and highly practical to wear as an everyday watch should you so wish, but mostly, it is a thing of beauty, to wear, use, treasure and enjoy. Should you wish to view it this way, it will also make an excellent investment or heirloom piece, because as each year goes by, and the world market for vintage gold watches grows ever greater, limited supply, linked with particularly high demand from the Far East, means prices will inevitably climb ever higher! A beautiful example of a timeless classic from one of horology’s most prestigious names, which if treated with care, will provide excellent reliability as well as a sound financial investment, as long-lasting as the watch itself! We are happy to accept PayPal as this is the quickest method of payment. However, if you would like to pay by UK cheque or UK bank transfer we will be pleased to assist you with this and pass on a 3% saving to you. Similarly, if you wish to pay by International SWIFT or Bank Wire Transfer we will provide you with our BIC / Swift number and our IBAN number. If you have any questions please call us on our Landline 0207 727 7095 or Mobile 07515 949250 or if calling from overseas, on Landline +44 207 727 7095 or Mobile +44 7515 949250.